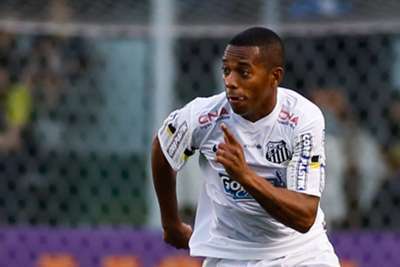 Robinho scored his first goal since returning to Santos, as the Brazilian Serie A club advanced in the Copa do Brasil on Thursday. In just his second appearance in his third stint at his boyhood club, Robinho struck the opening goal in their 2-0 victory over fourth-tier Londrina, which saw Santos triumph 3-2 on aggregate and reach the round of 16 of Brazil’s premier cup competition. Santos and fifth-tier club Santa Rita progressed on Thursday, while on Wednesday Serie A outfits Sao Paulo, Internacional and Fluminense were all surprisingly eliminated. At Santos’ Estadio Urbano Caldeira, Robinho opened the scoring in the 53rd minute, collecting a throw-in that was chested down by Leandro Damiao, before dribbling past two opponents and then smashing his shot into the far top corner of the net. Londrina had won the first leg 2-1 but were unable to hold on for penalties away from home, as Rildo struck the winner for Santos in the 89th minute after a cut-back from Robinho. Robinho joined Santos on loan from Milan on August 6. The 30-year-old striker previously spent a loan period with the club in 2010 from Manchester City, while his initial stint at the club ended in 2005 having first joined nine years earlier as a 12-year-old. In Recife, Serie B’s Santa Cruz drew 1-1 at home with Santa Rita, which saw the latter triumph 4-3 on aggregate. Rafael struck for Santa Rita in the third minute, while Betinho equalised with eight minutes remaining for the hosts, but the draw was enough for the visitors, who play in the Alagoano State Championship – effectively the fifth tier of Brazilian football. Earlier in the week, Sao Paulo hosted Bragantino – who sit third from bottom in the Serie B table – having won 2-1 away in the first leg. But after extending their aggregate lead in the eighth minute thanks to Paulo Miranda’s header, the tie fell apart for Sao Paulo, with Cesinha striking from the edge of the area after 21 minutes for Bragantino. The visitors levelled the tie at 3-3 when Gustavo Carbonieri headed a corner home in the 65th minute, while Bragantino completed their comeback 10 minutes later from another corner when Guilherme Mattis thrashed a loose ball into the net from six yards. Internacional lost 3-1 at Serie B-leaders Ceara to lose 5-2 on aggregate, while Fluminense also succumbed to second-tier opposition as America RN struck three times in the last 15 minutes in Rio de Janeiro to claim a 5-2 win and progress on away goals, after the tie finished level at 5-5. In the other third-round tie, Coritiba lost 2-1 at Paysandu but advanced 3-2 on aggregate.